Once upon a time, way back in the early 90’s, my dad took an early retirement from his job at IBM. I believe he was around 55 or so at the time. Back in the day an early retirement from an excellent company was totally do-able because companies were more likely to provide you with health insurance after retirement. That’s no longer very likely and now people like me will have to work until they are medicare eligible because health insurance has gotten so ridiculously expensive. But I digress. 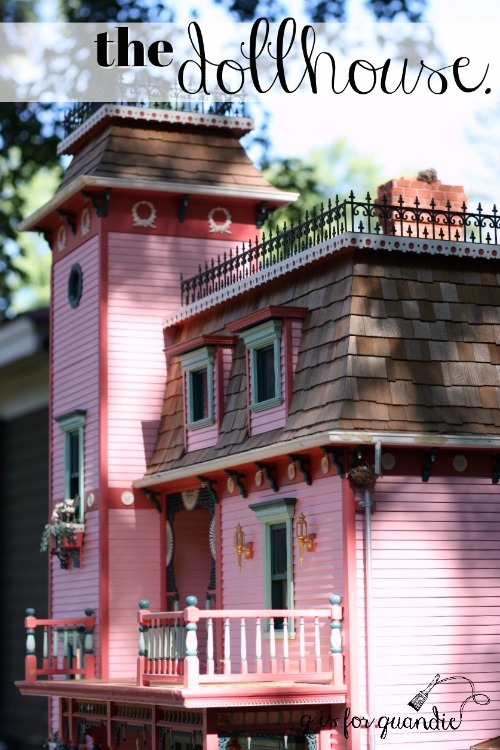 This is not a post about the ongoing woes of our health care system, this is a post about a dollhouse. You see, once retired my dad quickly grew bored. He desperately needed a project. So when I casually mentioned how I’d always wanted a dollhouse, he took that idea and ran with it. At the time my parents lived in Kentucky, and I was here in Minnesota. Now remember, this was the early 90’s. We didn’t have email. Nor did we have cell phones. My dad would take photos of his progress, get them developed and then send them to me in the mail. I would send paint chips, wallpaper (dollhouse sized) and tiny furnishings back to him in the mail. It was an awesome way for my dad and I to connect. We were both so excited about the project. I will always have fond memories of that time (my dad passed away about 10 years ago). All of that being said, the dollhouse is large and heavy. For a long time it resided in what is now the Q Branch and it took up the entire room since you really need to be able to get around all sides of it. I used to decorate it for the holidays when it was on display in that room, I even had a Christmas tree with working lights. 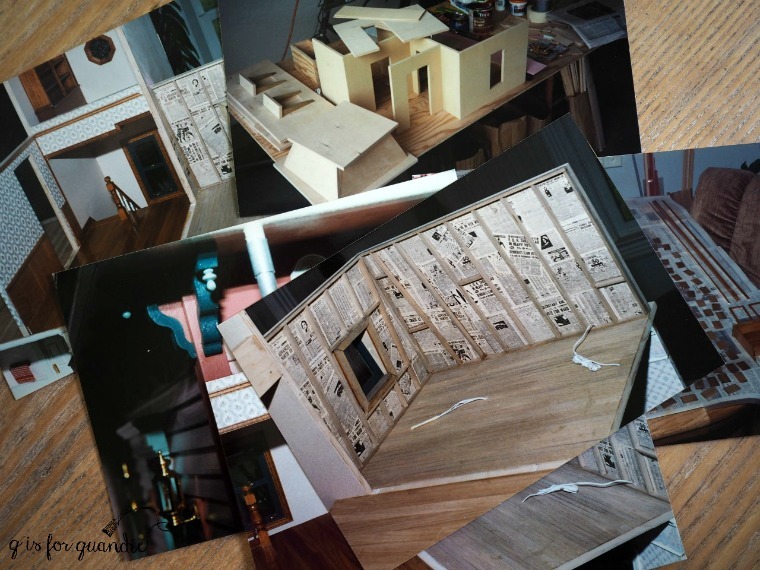 But eventually I decided that it was a poor use of a really great room so we moved the dollhouse up to the guest room where it has been sitting and gathering dust for quite some time. 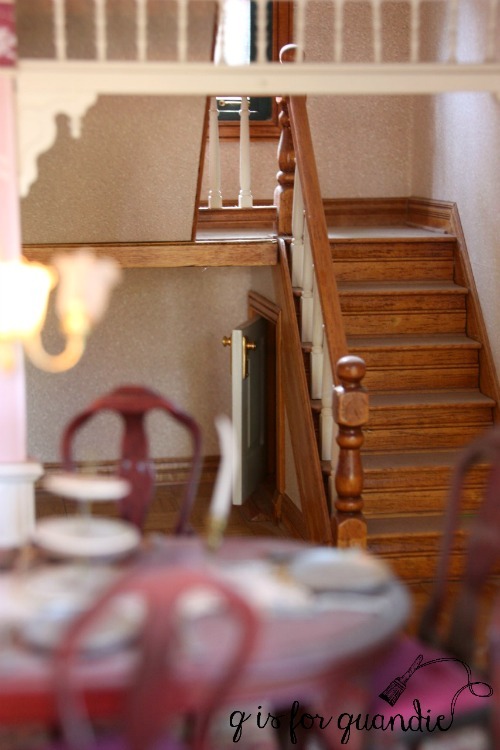 Since we had to move the dollhouse downstairs to refinish the floors in the guest room, I did some serious thinking and decided it wasn’t going back up. 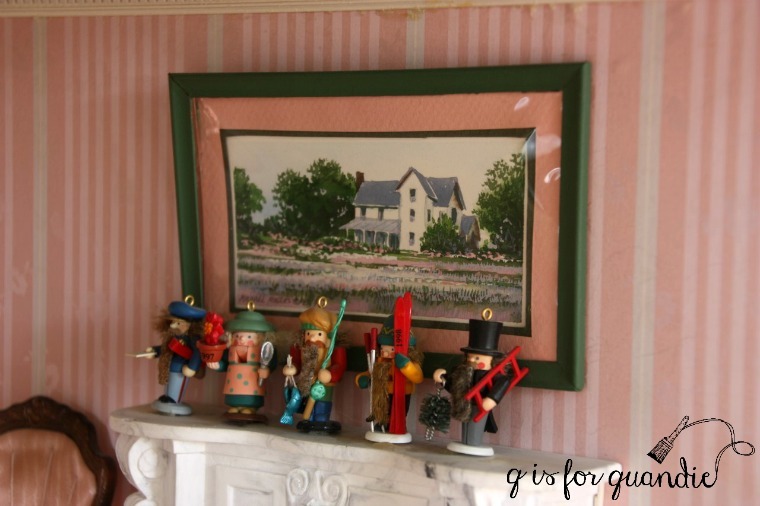 This will allow Mr. Q to take over the larger room as his study, and the smaller room will become the guest room with no space for the dollhouse. I just don’t have a large enough house to devote so much space to something that I barely pay attention to anymore. My niece used to always say she would take the dollhouse one day, so I asked her if she really wanted it. The answer was no. I offered it to a couple of other family members who also didn’t want it. I was starting to think I might have to just sell it, when Mr. Q’s step-dad mentioned that he would love to have it! 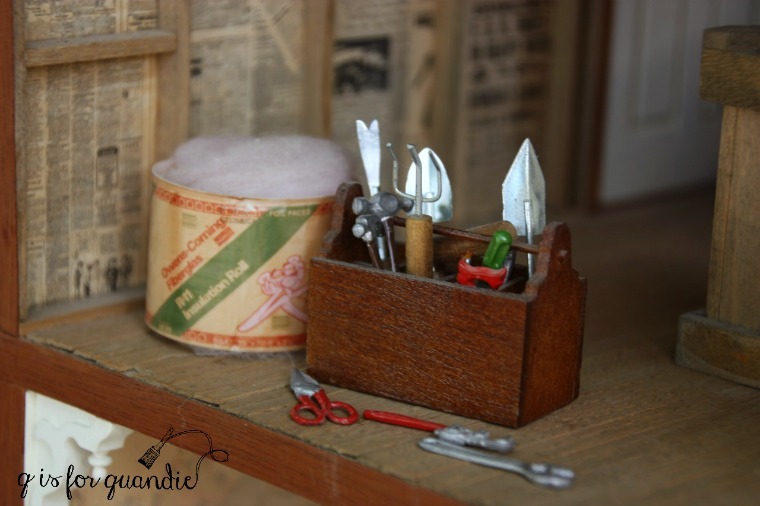 He loves anything miniature (just check out this post about his workshop for proof of that), plus he’s an extremely talented wood worker, so the dollhouse will be in good hands. So it’s a happy ending. The dollhouse is going to a wonderful new home. Tom is in the process of adding a three season wrap around porch at their farmhouse and the dollhouse will fit neatly at one end. I’ll be able to visit it whenever I want to, and the grandkids will all be able to play with it whenever they visit. Before I send it off to its new home, I thought I’d take a few photos to share with you guys. Gosh, where do I even start? If you haven’t already gotten yourself a fresh cup of coffee, you might want to do that now. This may be a long one. Since this dollhouse was for me, obviously it had to have impressive gardens. Most of the flowers are made out of Fimo clay. 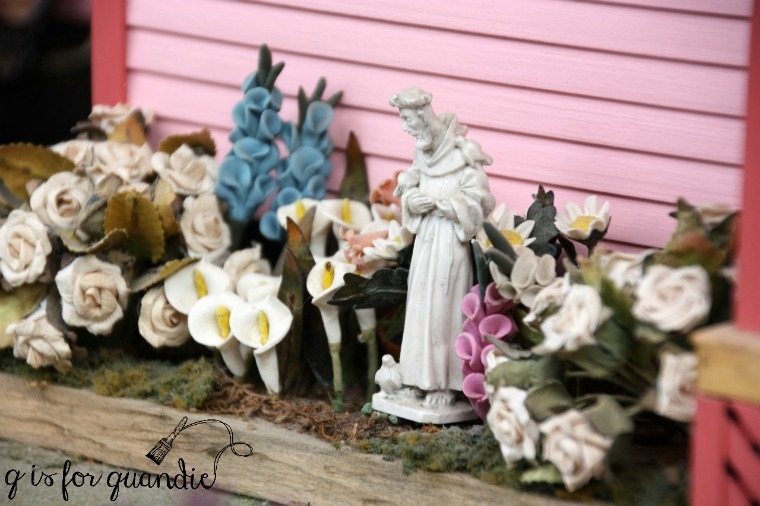 I made some of them myself, like the trailing vines in the window boxes, but it didn’t take me long to figure out that I really don’t have the patience for working with tiny things. and begin our tour in the kitchen. Did you notice the tin ceiling or the ceiling fan? Remember, this was decorated back in the early 90’s. Stenciled borders were all the rage. I added that stencil myself with a tiny little metal stencil. 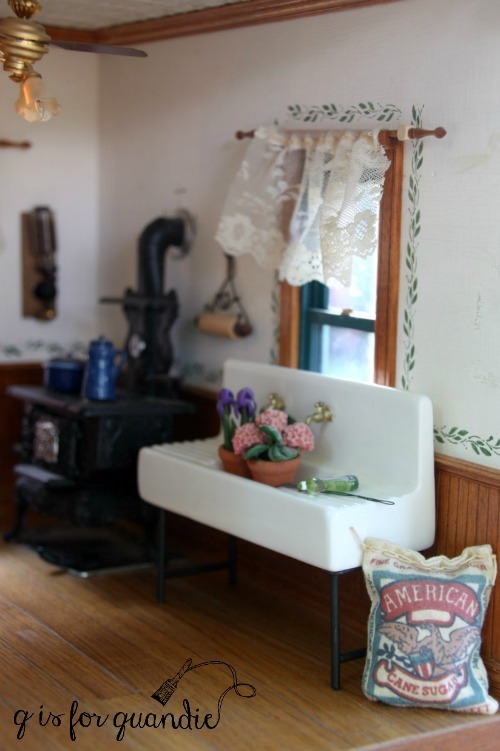 And even though farmhouse sinks weren’t quite as popular yet, I wanted one in my dollhouse! My dad was very detail oriented. 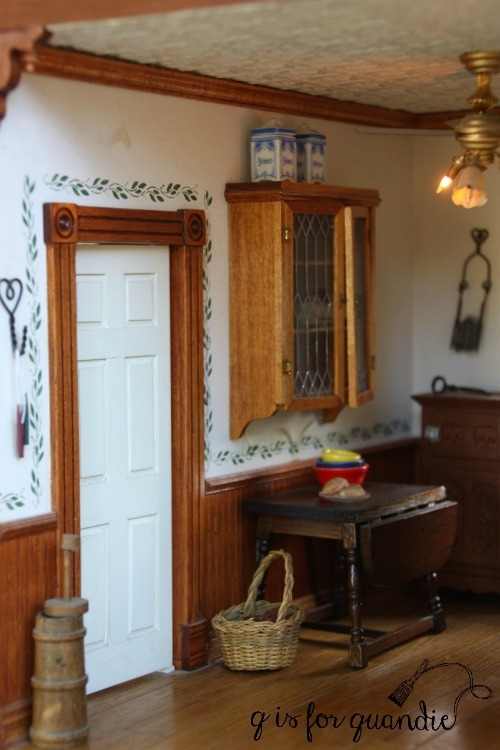 The door between the kitchen and the dining room is a swinging door. And check out the paneling below the chair rail, the parquet floor and the dentil crown molding above the stenciled border. I don’t know if you’ve noticed yet, but the dollhouse is fully electrified. Another example of attention to detail, there is a little door under the stairs that opens and closes. I suppose I could store the Christmas tree under there. See it back there? You can catch a glimpse of the foyer through the arched opening in the dining room. The floor in the foyer is a type of blue shale that is found in Kentucky. My dad just gathered some up from a field near his house and ’tiled’ the floor with it. 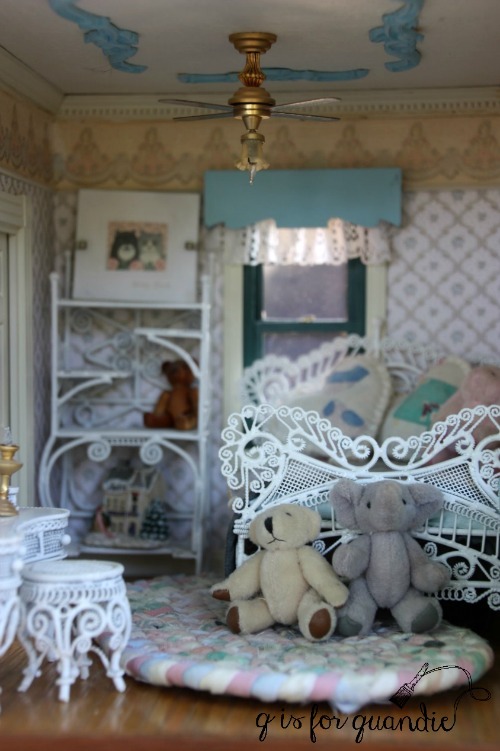 Boy, you can also tell the era of this dollhouse by all of the wallpaper! My real house was entirely wallpapered at that time as well. And the garish shades of pink, burgundy, sea foam green and forest green (all chosen by yours truly). Yikes! Here’s the living room. See that wedding photo on the wall to the left? That’s me and Mr. Q! Oh, and did I mention that my dollhouse has two original water colors on the walls? Yep, my dad was friends with local artist at the time and he asked him to paint a couple of paintings for the dollhouse. The first one hangs over the living room fireplace. The second one hangs over the master bedroom fireplace. I really can’t decide which one of these is my favorite, I love them both. Had I ended up having to sell the dollhouse I would have removed these and kept them. But now they will stay in place. Can I just mention here how much I love that fireplace? Isn’t it fantastic! This is another great example of my dad’s attention to detail. 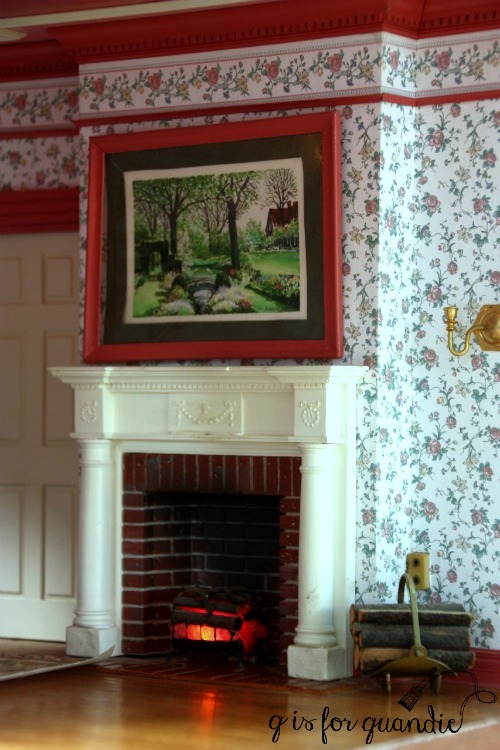 He purposely added black ‘soot’ to the brick fireplace insert so it would look well used. See it? The little pile of logs on the fire is electrified so that it glows like a real fireplace. Currently the master bedroom is sparsely furnished with just this lovely four poster bed. Next door is the bathroom. 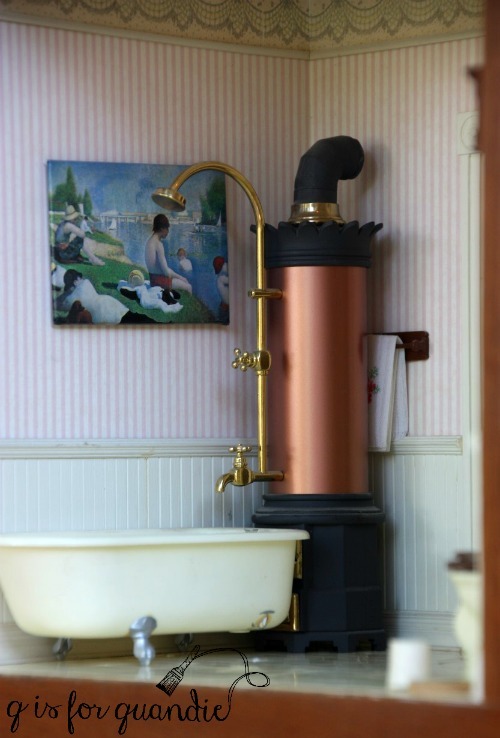 Originally there was just going to be the claw foot tub with the towel bar above it, but my dad found this amazing hot water heater and had to have it. I love all of the details in this room; the tile floor, the wainscoted wall, the tin ceiling, the wall mounted sink, even the little toothpaste box next to the sink. But I can’t lie. 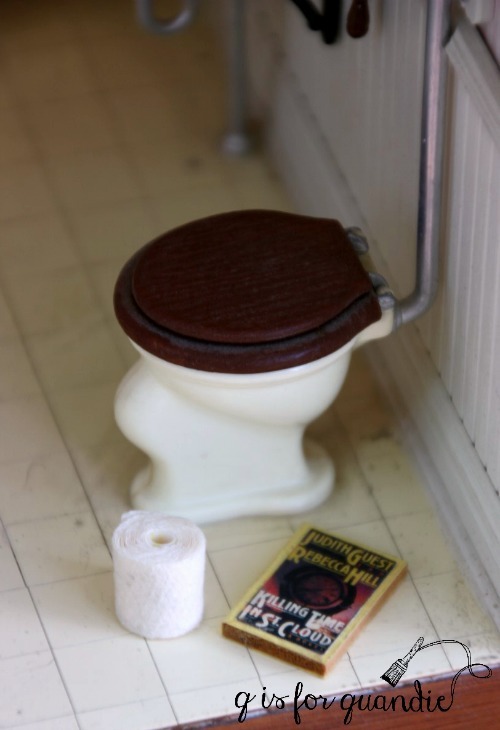 My favorite detail in the bathroom is the tiny roll of toilet paper. Seriously, does that thing just crack you up or what? I decorated the second bedroom in the house as a young girl’s room. Naturally. 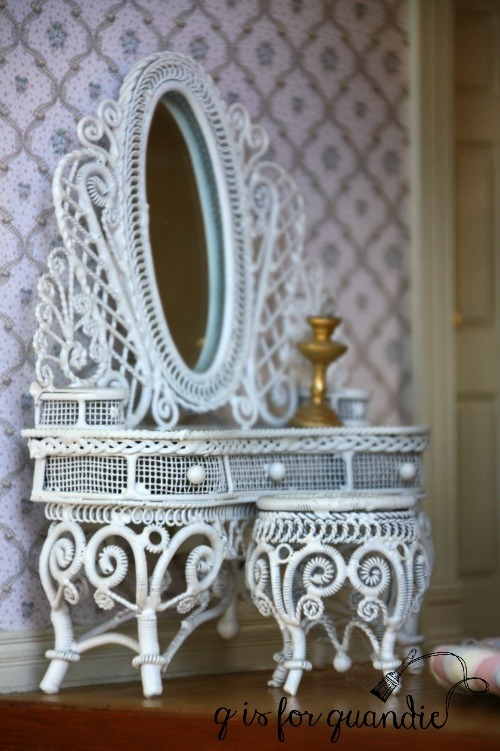 Complete with a faux wicker vanity. Just above the girl’s room is the attic. I believe my dad originally came up with the idea for this space when he found the newspaper wallpaper. 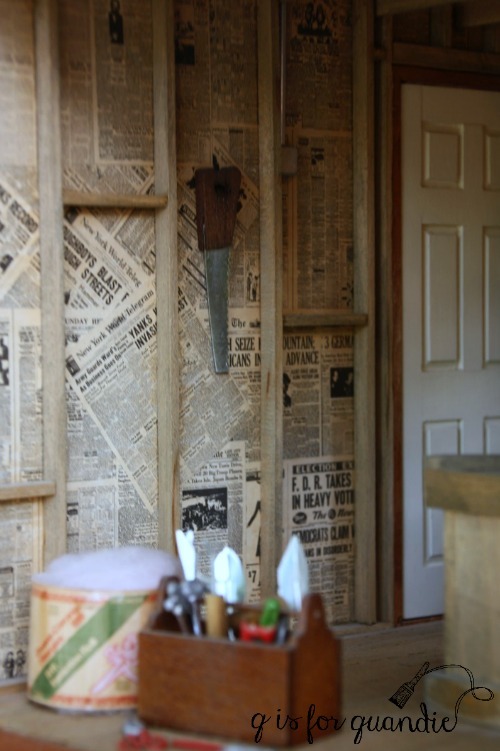 My dad had a lot of fun with the details of this room like the exposed studs and electrical, and we both had fun coming up with stuff to ‘store’ in the attic. The other room on the 3rd floor was inspired by the pool table. When my dad found that, he knew he had to have a room for it. Last, but not least, there is one more tiny room tucked away in the tower. A cozy little reading nook. I hope you enjoyed this tour of the dollhouse. I’m looking forward to a week off the day job next week. A little staycation, during which I plan to work on my master bedroom makeover. I’ve got several projects planned, so be sure to stay tuned! Categories just stuff., my house. Wow… this house is amazing. The attention to details is what puts it over the top. Although you have to give it up, you will always have the special memories you and your dad made while making this house so special and now you have the photos as well. Cherish them always. Oh my gosh! I would not get rid of it! I would find a place for it! Linda, this dollhouse is museum quality! So special that your sweet Dad and you made it together, although over a long distance and through developed photos and snail mail. Makes it all the more treasured! So happy that you found a good home for it, because now you know it will be well cared for, for years to come. My husband was working on the road back in the 90’s and would be gone from Monday until Thursday night. I asked him to build a dollhouse for our youngest daughter during that time, (to keep him productively occupied on those nights in the motel) and it is also furnished with 90’s style wall paper, stencilling around the windows, and the colors that were “in style” during that time, but nothing as elaborate as yours. Our daughter loved it, and now that we’ve moved, our older daughter adopted it for her daughters when they get old enough to play with it. Great memories. Thank you for sharing, and I look forward to seeing what you transform during your staycation! How awesome! And you are exactly right about my dollhouse going to a good home where it will be well cared for. I know that my in-laws will take better care of it than I did. Tom will fix up the broken bits (because there are a few now) and most likely even add some improvements. This dollhouse is amazing!!!! All of the hours of work and such attention to detail is something. Your father put alot of love in his project. I would NEVER be able to part with something so wonderful made with my father’s loving hands. I would have HAD to find a place in my home for it so I could enjoy and continue to appreciate him and his work. You are not alone in feeling that way Emmie. Several of my friends have expressed that same opinion. But for the last 10 years or so it has been mostly ignored and just gathering dust. I’d much rather have it going to somewhere where it will be admired and maintained properly. I was always told that even if you get rid of the “physical” you will always have the memories and that is what matters. 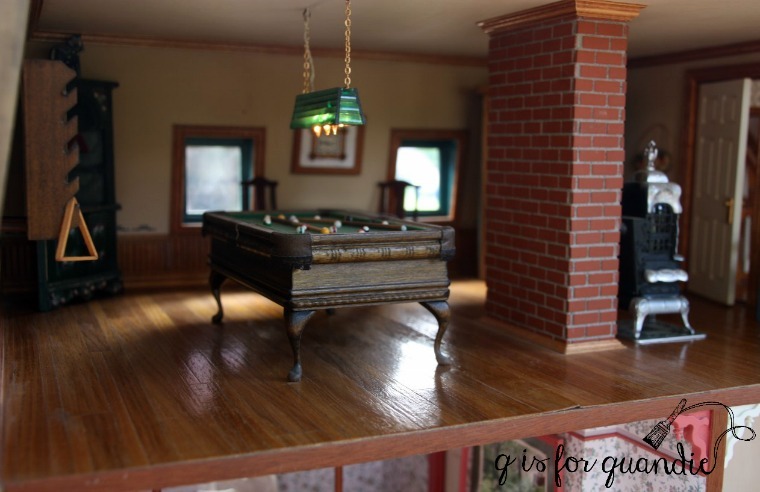 The dollhouse is not your dad– just a reason for some really great memories. How have I not seen this? I am so emotional and incredibly happy it’s going to family. That is a treasure! What an amazing project to have memories doing with your Dad. Plus, now it’s documented here on the blog! I’m sure the grandkids will have countless hours of fun exploring and create a new generation of memories with it. Such a great post. I see you get your attention to detail from Papa Q. Sadly, you have not see it because it was tucked away upstairs in the guest room covered with a sheet most of the time. I’m super happy to have it going to the in-laws. I know that they will take good care of it, but even more importantly I know they will treasure it. And the reality is that eventually it will come back to me and I’ll have a chance to revisit this issue again then. Love that capsule of time! I had all of that decorating at one time, the stenciled borders, the wall paper and some of the colors… But your father did a wonderful job with the house and I’m so glad it will stay in the family. I can’t believe the detail of the paintings your father’s friend did. And all of the wainscoting and beadboard on the walls. What a treasure. Thanks for sharing the dollhouse, I know you love it and are a little sad it is not in your house anymore. Those paintings blew me away too. They are really so lovely. This is so wonderful. Have you thought about painting it white so it would go better in one of your rooms? Of course you have. LOL, yes, of course I did 😉 But, the problem isn’t the color (although it would be amazing in white! ), it’s the size. I think my photos don’t really do justice to how large it is. 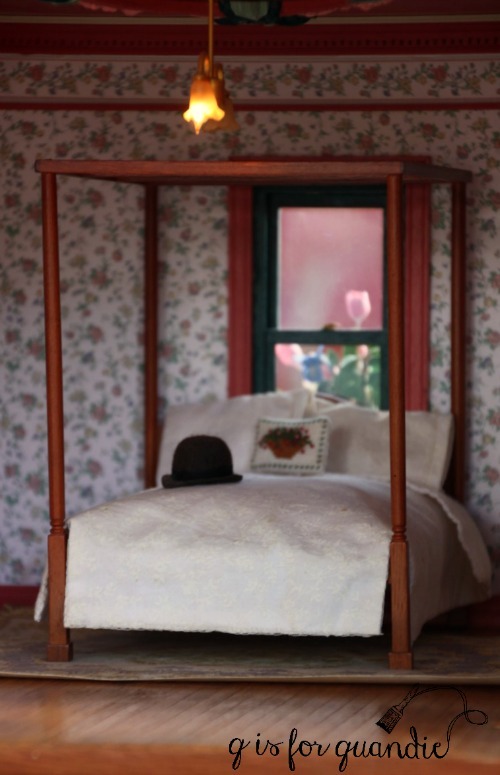 If you look back to the dresser it sat on, then realize that the dollhouse actually hung over by a couple of inches, it might give a better perspective on how big that thing is. With my small house it basically takes up an entire room! Thanks Wendy! And thanks for following my blog 😉 Yep, amazing detail. My dad was very detail oriented! That dollhouse was adorable. You would have had to knock down my friend Amy to get to it first though. I think you were both waiting at the ribbon to run in and grab something. For her it was the dollhouse! Thanks for making me feel better about those 90’s colors! 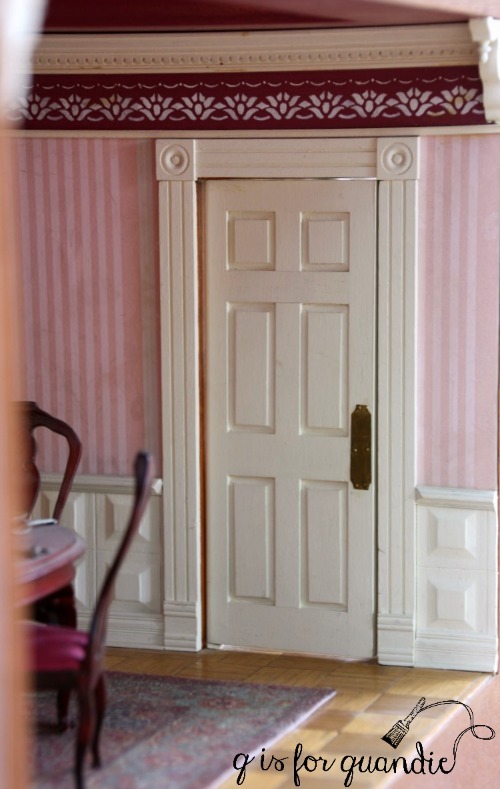 And if you really want to see some museum quality miniature rooms, check out the Thorne Rooms at the Art Institute in Chicago. They are simply stunning. The detail is absolutely amazing! What a beautiful gift. So nice that it will go to someone who will appreciate it as much as you do. I think it might be more accurate to say that they will appreciate it even more than I do 😉 Which is a good thing! Some of the photos of the rooms and outside shots could be mistaken for a real house! fantastic. I was really smitten by the newspapered attic. Isn’t that newspaper awesome! My dad got a real kick out of designing that attic. This is so beautiful. Such a magnificent gift! and memories with your Dad! When I began reading your post today, I was afraid that your lovely dollhouse was going to be sold. How wonderful that Tom will become its new caretaker. You couldn’t have searched for anyone more qualified to take over its care. What a lovely turn of events, your dad would be pleased. I’ll admit I was beginning to wonder what I was going to do with it before Tom stepped in. You are so right though, he is extremely qualified to take over its care! My dad would be pleased. 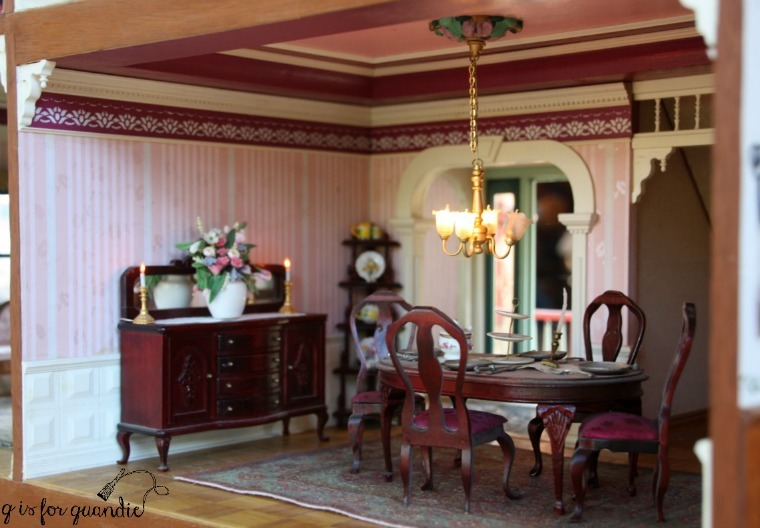 I have loved this dollhouse since I first saw it. All the little details and all the love and hours that your Dad put into it. Great that it’s going to be seen again. I loved the story and photos of its construction too. I think it’s deserving of a museum spot eventually too. Your Dad was a very special and talented guy for sure…must be where you inherited your attention to detail. Hard to believe its been 10 years too…. All of the comments this morning have really had me thinking about what my dad would have wanted, and I can say without a doubt that he would want the dollhouse to be seen and admired. Not tucked away in my house out of sight and out of mind. Ultimately it would be nice to find a home for it in a museum or other public space where lots of people could admire it. Down the road I may have to search for just such a place. But for now it will be well cared for at Tom & Naomi’s place! 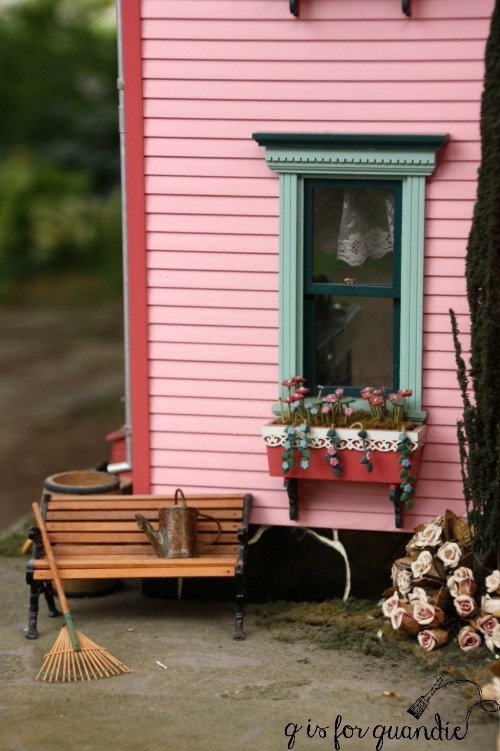 This little doll house is gorgeous! Your dad was very talented. I know it has brought you hours of joy! I would have loved to have had something like this growing up. Oh heck, I would love to have something like this now!!! Jaw dropping beautiful! I want to live in that house! 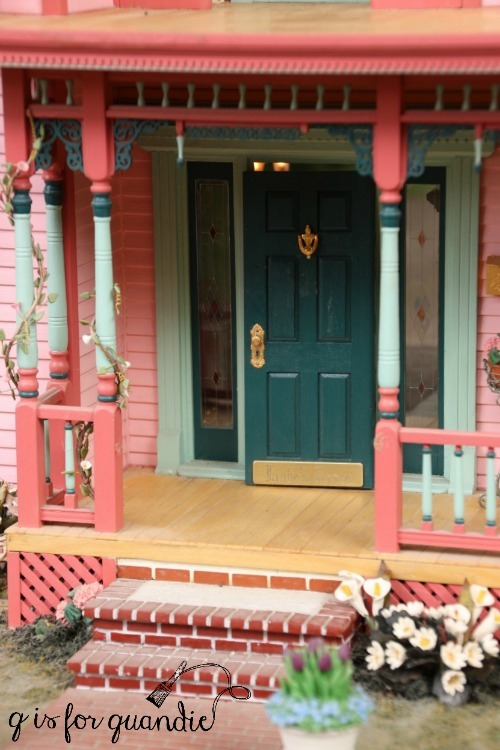 It is every girl’s fantasy doll house…. what special memories were created in its creation….thank you for sharing! I think if I lived in that house I’d have to strip a lot of wallpaper. And update a lot of paint colors. And my neighbors would be whispering behind their backs ‘omg, why did they paint that house PINK!’ LOL. But it definitely is a fantasy doll house! Great family story Linda. He definitely had a gift to be able to work in such miniature scale. 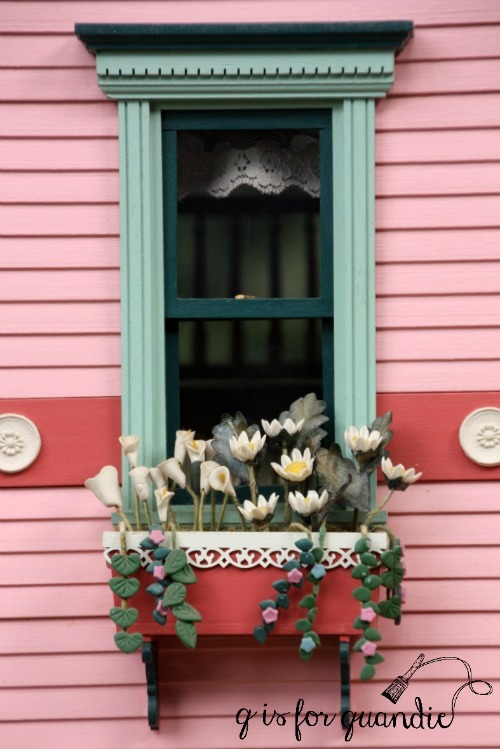 Some of my favorite things are the flowers and the flower boxes, that lovely painting of the old farmhouse – which I could move right into and then the dollhouse in the attic of a dollhouse. I think it’s wonderful that you located the perfect home for it. It does look like you got your attention to detail from your dad perhaps and a love of travel from your mom. Just an observation. Yes, you are right on both of those counts Victoria! Although I did inherit my attention to detail from my dad, I did not inherit the gift to be able to work in such miniature scale. I am all thumbs when it comes to the mini stuff. I tend to be like a bull in a china shop. I try to fix something, and end up breaking two or three more things in the process. Well listen you can’t have all gifts and you definitely have your fair share. Miss furniture rescuer extraordinaire! I used to be more like that, but as I get older I find myself deciding that things are just things. The memories are what matter, not the things. As for your hope chest, have you considered painting it or otherwise making it over so that it becomes something that you love in your house? It is one of those Lane cedar chests with the needlepoint tops that you can sit on. It is like the maple colonial style we grew up with. (I think we are the same age). I recently tried fusion paint on a farm table base that I had originally planned to do the chest with. It turned out well. I know you could make my cedar chest beautiful, however I am not as talented as you are! I may just take your advice and get rid of it. I know I still have the memories.. Thank you! Well, I fully support your making the decision to get rid of the ‘thing’, but keep the memories. However, if you can’t quite bring yourself to get rid of it, how about painting it with Fusion’s Limestone (creamy white) and then re-upholstering the top with a grain sack. Easy peasy! Oh, my goodness — this house is unbelievable! Such great effort to every detail! I’m so glad you appreciate all the work (and love) that went into it and that you have found it a new, loving home! I must admit my eyes leaked a bit reading this! Dad and daughter relationships are so special. 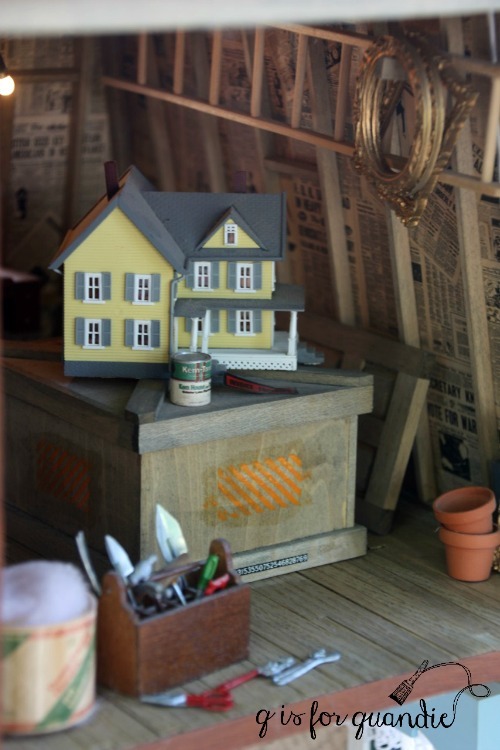 It’s simply an amazing story and an incredible dollhouse!! We just sold our house that we lived in for 24 years. We closed on it today. I didn’t have any real emotional attachment to it but I did have attachment to my yard, filled with my Great-Grandmother’s peonies (a total of 48! ), Lenten roses, daffodils, gardenias, camilias, cone flowers, etc., etc., which I dug up; my mom and daughter-in-law are plant sitting at their houses until we find another house. (Bless my husband for his strong back as he helped me!) Anyway, all that to say, thank you so much for sharing your wonderful doll house. It made me cry, to see all the amazing details your dad created. 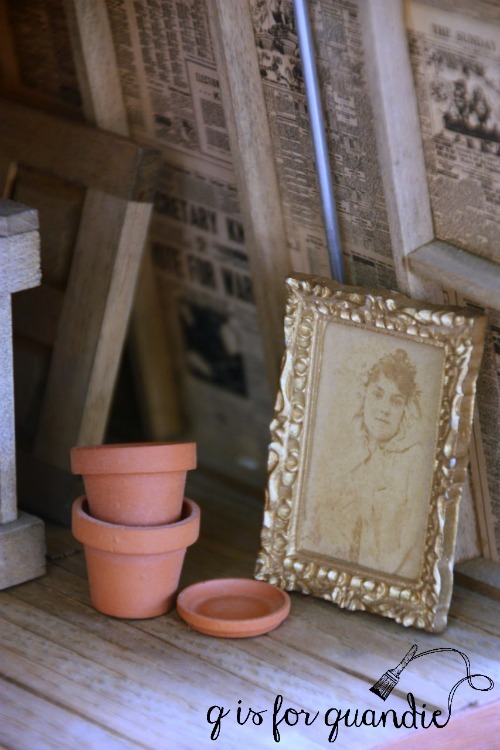 He must have loved you so much 🙂 While I found it surprisingly easy to let go of our actual house, just the thought of leaving the memories and remembrances of my Great-Grandmother, through her plants and plants I’ve added, was heart-wrenching. 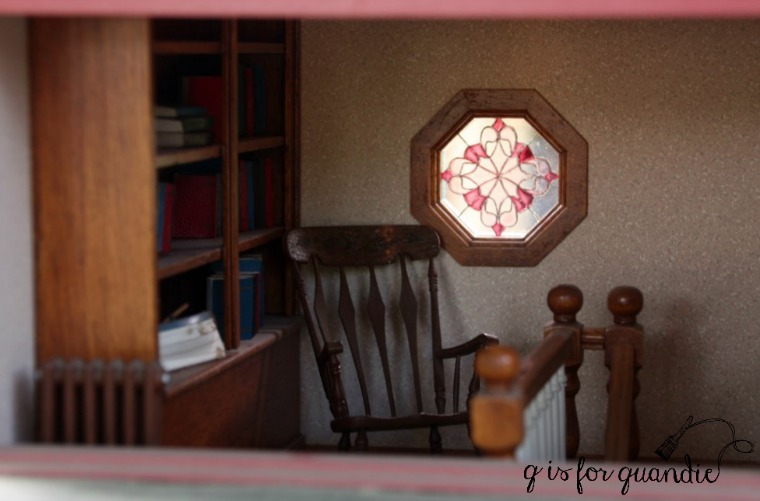 While it made me sad that you don’t have the proper space to continue to hang onto your sweet pink house, I’m so glad you found a proper home for it and you can visit it – and revisit that special time you shared with your dad. I got my gardening gene from my grandmother. She was already 65 years old when I was born, so when she passed away in her early 80’s I was still a teenager. Too young to have my own garden. And the gene had definitely skipped a generation, my mom wasn’t interested in gardening at all. So none of my grandmother’s plants were saved. I’ve always thought it would be pretty fab to have some heirloom plants in my garden, but no such luck! Lucky you to have them, and I’m so glad you’ll be able to take them with you! I was just talking to Elise at work today (I work at the Washington County Historical Courthouse, in case anyone else is reading this) and she thought it might be a great display sometime. I’m thinking perhaps the Victorian Christmas. We could dress her for Christmas to stay in step with the season. What a great idea hon! This is one of the most amazing things I’ve ever seen! Thanks Teresa! I wish my dad could hear some of these compliments, he would love it! Your story brought tears to my eyes! 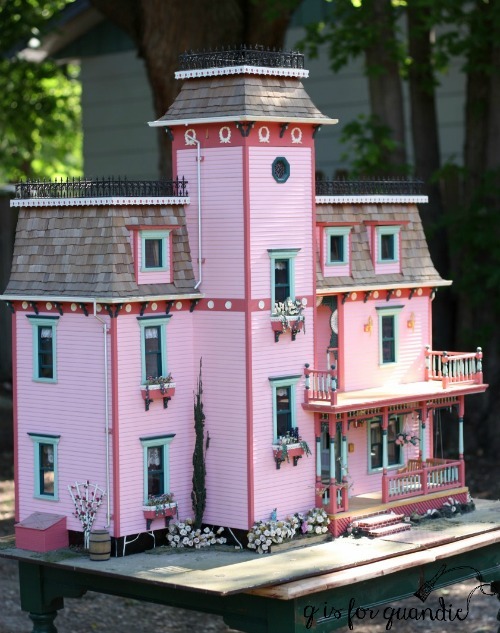 What a gorgeous doll house! I would have loved something like this from my dad!! You should consider keeping it, it’s a treasure!!! If it weren’t so large, I would consider keeping it. But it’s just too big. Or maybe it’s more that my house is too small. I have never seen such a beautiful memory as this. I don,t know how you can ever part with it. So sorry you do not have the room for it. It is unbelievably gorgeous. Your Dad was a genius. Regards from Betty in Ontario. I’m not going to part with the memories, just the dollhouse 😉 And I can visit it whenever I want too, which is an added bonus. So SWEET! I can just picture you and your dad working on it together. Now we all know where you got the ” Attention to Detail” gene. Wow, what a great family story. lad you found a place for it – there have been lots of things at my mom’s house that had sentimental value, but I couldn’t keep them, It felt good when they found a home with someone else who appreciated them. Valerie! It’s so nice to get a comment from you! LOL, yes, my dad was a big man and he had huge hands. Honestly, I don’t know how he worked with all of those tiny things. I am all thumbs with them. And you are so right, it does feel good when things like this find a home with someone who will appreciate them, and Tom & Naomi definitely will! Thank you so much for taking us on a tour of your amazing dollhouse! I’m blown away by the attention to detail in every little corner of the house and had to go back several times to look at your wonderful photos. Truly a gift of love. Thanks Vickie! 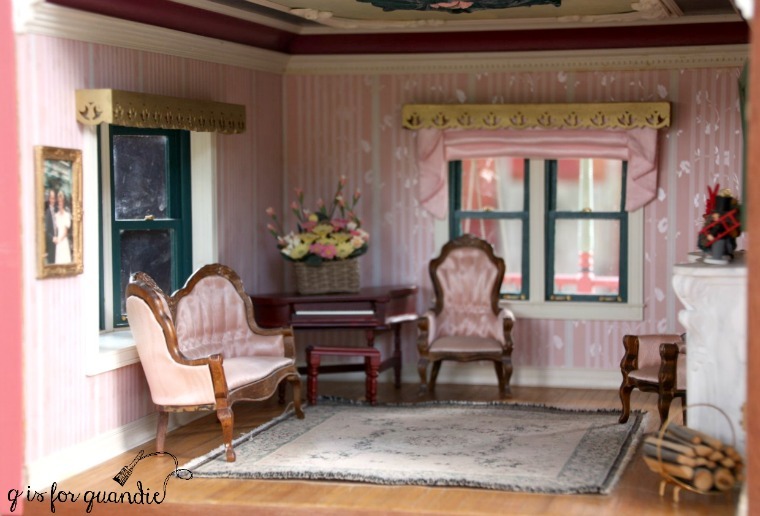 Taking the photos and writing the post was a great reminder to me of the details that went into the dollhouse. My dad was definitely not one for doing things halfway! 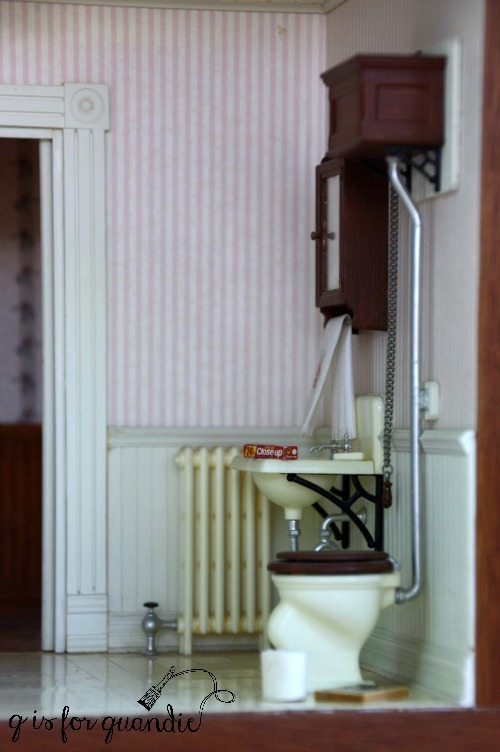 That dollhouse is…beyond words! I’ve never seen anything like it. Meticulous! What love and talent went into making that!! Beautiful. My dad was always really skilled at tinkering with little things. When we were kids he once made a TV. Back in the day when you could make TV’s from a kit, you know with picture tubes and such. That makes me sound like I’m 100 yrs old, but not quite. It was the 60’s. The doll house is really amazing! Such detail. A lot of creativity and talent in your family! Thanks Monica! Funny, I didn’t think about this when I was writing the post but when you mentioned ‘family’ I was reminded that my dad’s dad (my grandpa) had a train set that took up his entire basement. There was a small town at one end, and then the tracks went out into the countryside. It was extremely detailed with roads, signs, people, cars, bridges, etc, etc. Clearly this sort of thing does run in the family! So glad Tom is taking the dollhouse. Can’t wait to see what he does with it. I think dad would be very happy with that. It would be cool to see it all dressed up at the Courthouse for Christmas. I think so too. If anything, he’d be appalled that I had it tucked away upstairs for as long as I did! You KNOW my love of miniatures so this post was right up my alley, what an amazing dad and what an awesome project for you two to work on. Inspiration for the blue house I bought at your sale for SURE! I’m trying to think of my favorite room but they’re all so great, the attic is in the running. Thanks so much for sharing!! Swooning!! 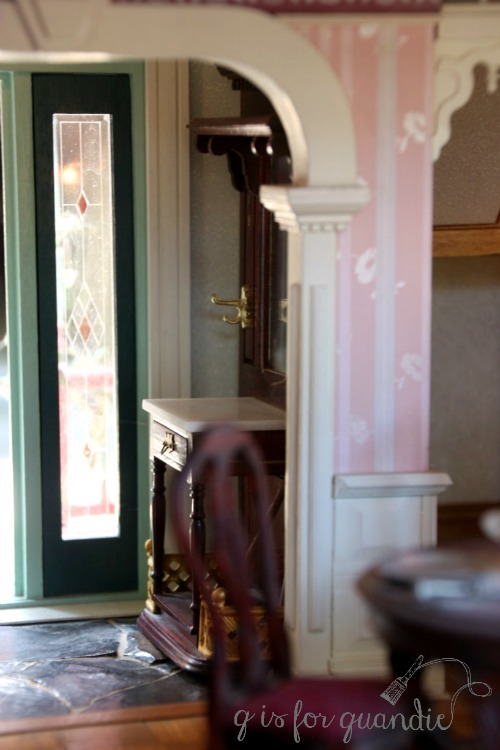 I am overwhelmed by the level of detail your father put into this lovely dollhouse. It is fabulous. What a wonderful memory for you. Yep, my dad was definitely detail oriented!